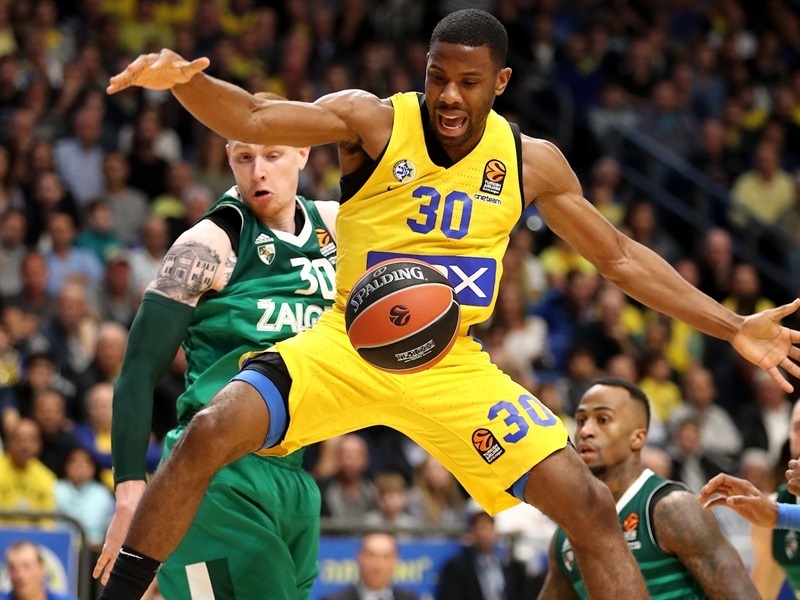 Maccabi FOX Tel Aviv held off a late Zalgiris Kaunas charge for an 81-74 victory on Thursday at Menora Mivtachim Arena. 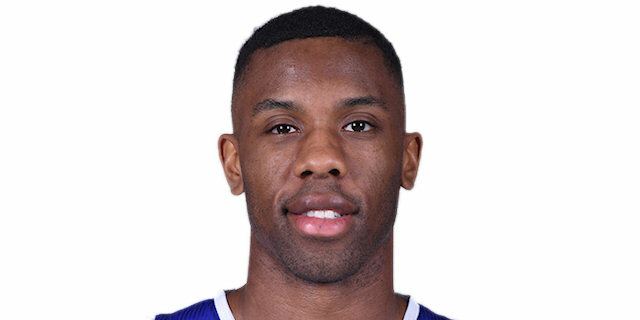 Norris Cole scored a season-high 26 points off the bench to pace Maccabi, which improved to 6-4. 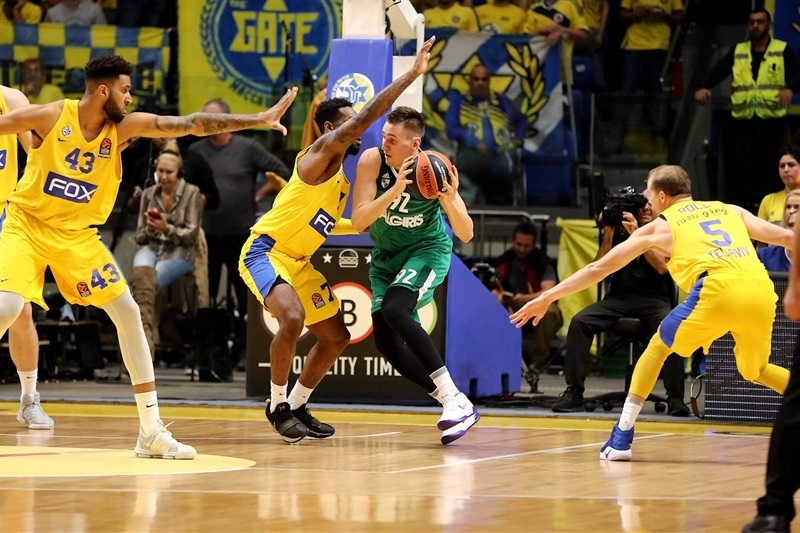 The hosts led by as many as 16, but Arturas Milaknis made 4 fourth-quarter three-pointers, including a pair on a 0-10 run to start the quarter, as Zalgiris rallied to within 3 before Pierre Jackson and Jonah Bolden helped Maccabi hold on. Jackson finished with 12 points and 6 assists and Bolden posted 10 rebounds, 4 assists, 5 steals and 4 blocks in a standout defensive performance. 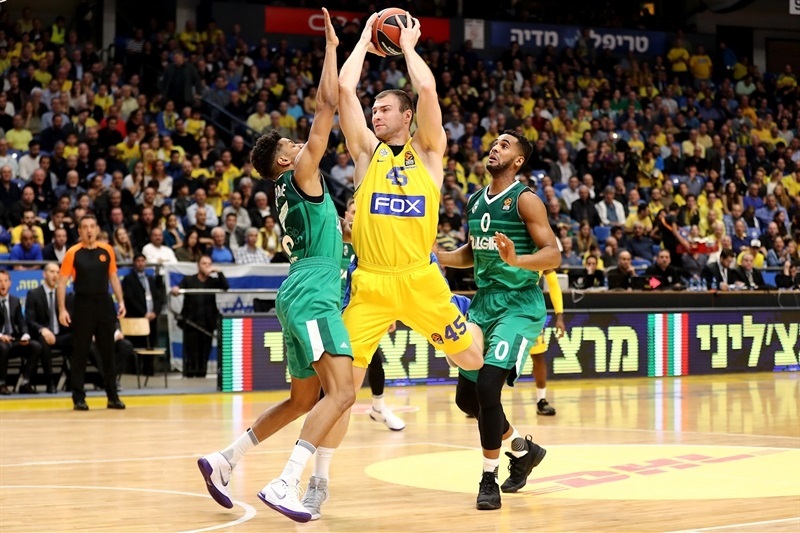 Maccabi made 10 of 18 three-point shots (55.6%), while Zalgiris slumped in shooting 7 of 28 (28%) from downtown in one of the keys to the game. Milaknis finished with 19 points, Kevin Pangos recorded 12 points and 6 assist and Paulius Jankunas added 11 points for the Lithuanian champs, who fell to 5-5. 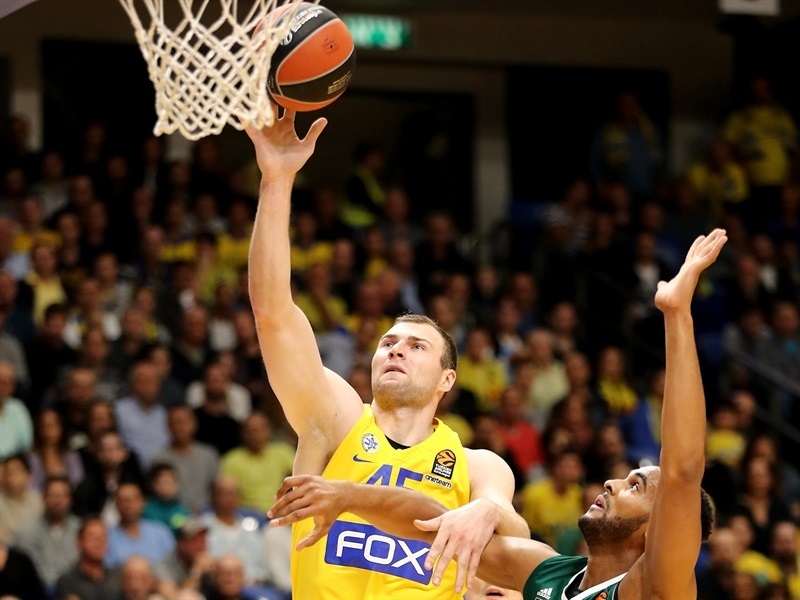 Art Parakhouski scored on three successive possessions to help Maccabi jump out to a 5-2 lead. However when Maccabi stopped going inside, Brandon Davies scored twice to put Zalgiris up 5-8. The offenses heated in the middle of the opening quarter, with Alex Tyus stepping up for the hosts with 8 points, including an alley-oop slam to beat the first-quarter buzzer that made it 15-14. The lead changed hands with each of the first four baskets of the second quarter. Edgaras Ulanovas tied it at 20-20 with a put-back. 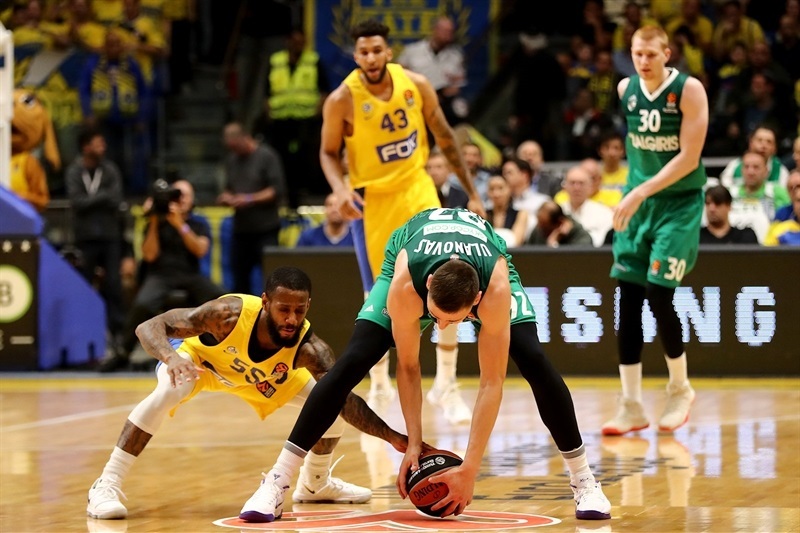 After the visitors missed seven times from downtown, Pangos buried a three-pointer to put Zalgiris in front 22-23. 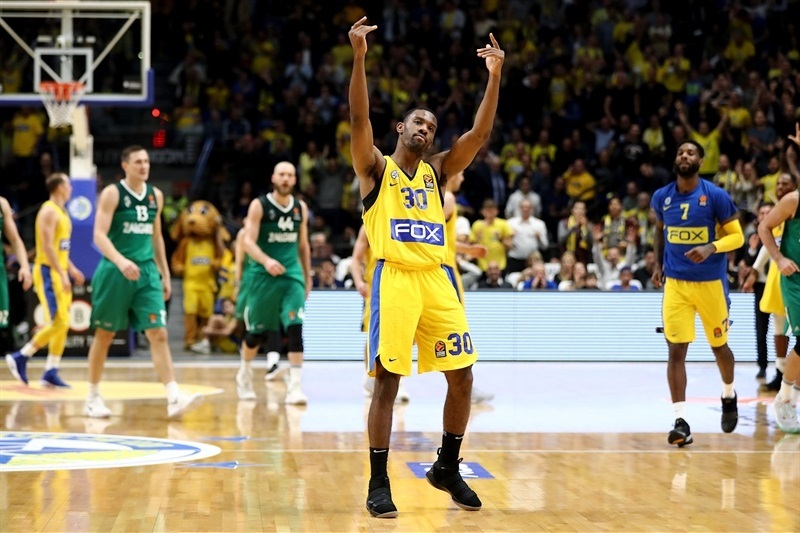 DeShaun Thomas sank Maccabi’s first triple and added a basket on the break before Parakhouski’s free throws made it 31-27. 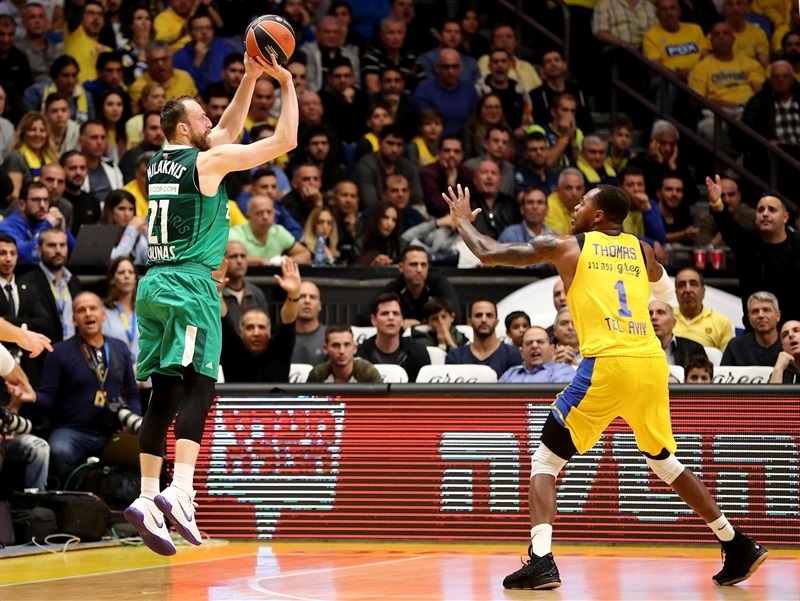 Maccabi extended the lead with points from the line from Parakhouski, Jackson and Bolden before Cole drilled a triple to cap an 11-2 charge that gave the hosts their first double-digit lead, 39-29, at the break. 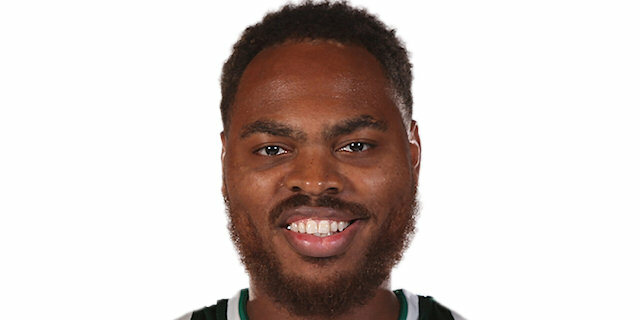 Little changed at the start of the second half as Zalgiris continued to struggle from long range, while Cole followed a two-point jumper with a three-pointer as the margin grew to 16. Jankunas got going with a pair of mid-range jumper as the visitors closed to within 49-37 midway through the third quarter. 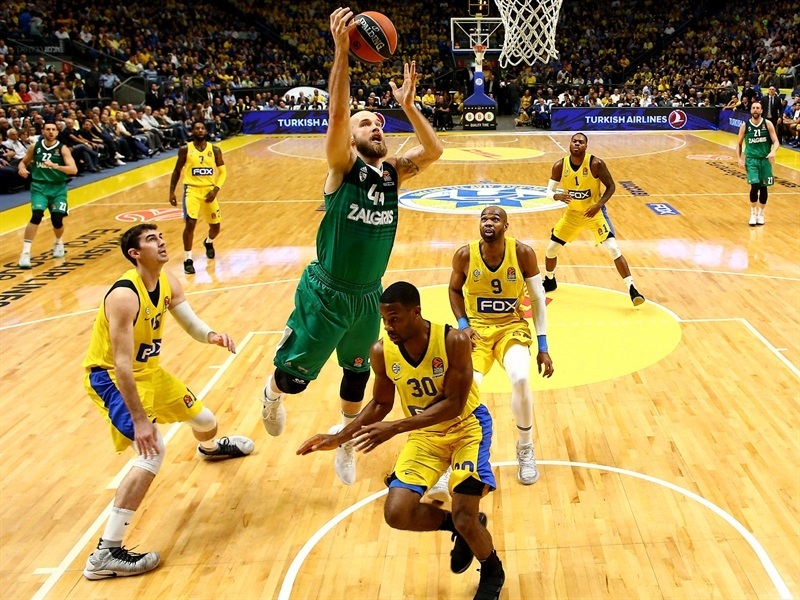 Michael Roll stretched the difference to 16 once more, but Jankunas and Davies kept the hope alive for Zalgiris. The visitors started to press with mixed results and Cole ended the quarter with a jumper for a 65-51 lead. Milaknis drilled a pair of threes to start the fourth quarter and bring his team within 8. After a timeout, a layup by Jankunas and Paulius Valinskas’s tip-in caped a 0-10 run that made it 65-61. Bolden dunked to end a five-and-a-half minute long scoring drought for the hosts, but Milaknis’s next triple made it a 3-point game. 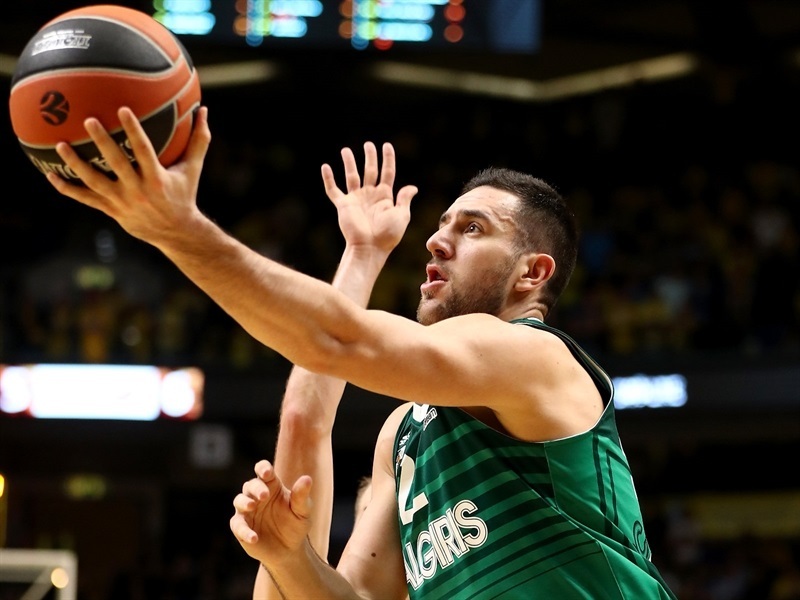 Jackson and Cole sandwiched threes around another Milaknis three as Zalgiris continued to believe. 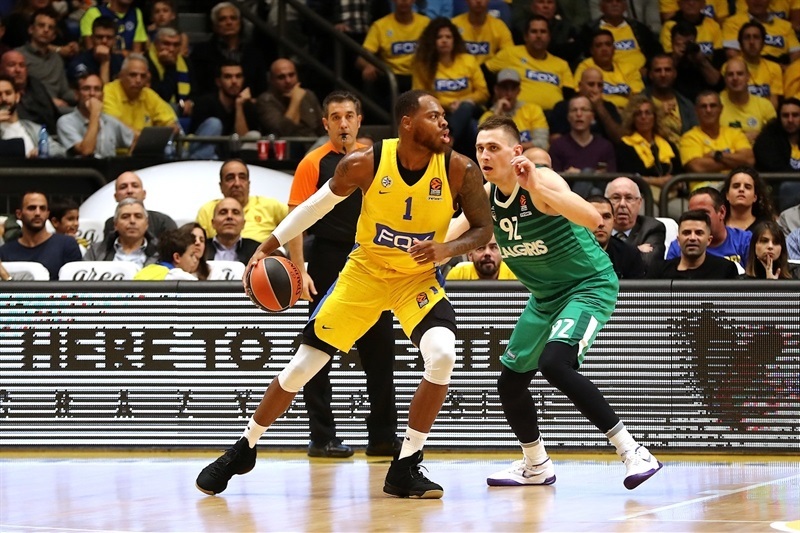 However Jackson’s steal and free throws and a three by Bolden helped Maccabi remain in control to hold on for a tough win. 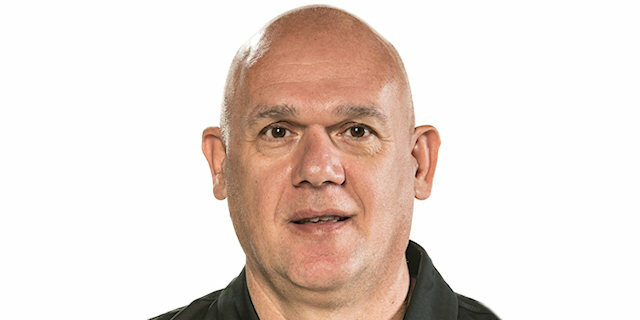 "I think even though we scored 10 threes today at 55%, we won the game on defense. We limited them, especially in the first half, and I think it was the key to the game. 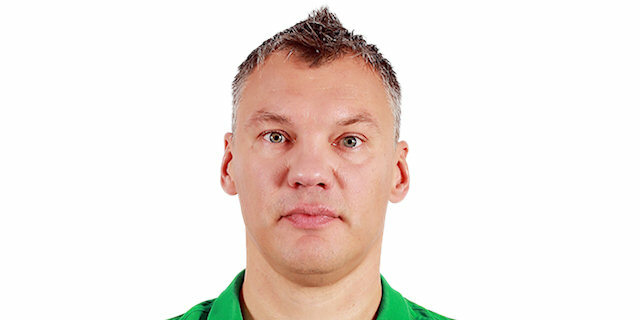 And like I’ve said many times, if you make some extra threes, it always helps… Zalgiris is a very good team. They are able to cover so many things. They play as a team, like I said in the pre-game… Today they surprised us by outrebounding us, but also we probably surprised them with other stuff and because of that we won the game." "We only hit shots in the second half. I believe for our young team, this is great experience to play in a gym like Yad Eliyahu. 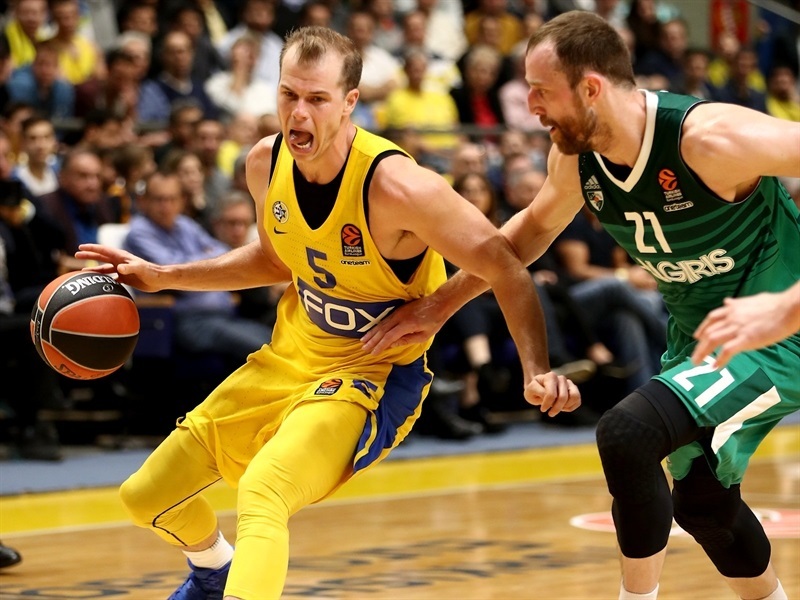 I was really afraid with all due respect to Maccabi, the coaches and the players, I really was more afraid of the atmosphere factor than the team factor. For some players it’s their first time playing in this gym. Here the atmosphere is second to none. It’s very difficult to come back from being 16 down, but we managed to. We started to play a little solid. We shortened the rotation with the players mainly that were here last year, that know the system and pick up the system… Hopefully the last 20 minutes is the idea of where we have to go and how we have to play." "When we shoot the ball well, then we can win. We take every game for itself and we don't think too much far ahead. We just want to keep improving, keep winning and learn from every lose." "I just know that we need a win tonight. And we had to give extra effort, we had to do whatever we had to do just to get back on the winning track. Hopefully we do thrive under pressure. Tonight it was just about protecting our home court."